My little grandson slipped on his momma's shoes the other day and tried to walk around in them. Shortly after, she had to hurry to work so I let him walk around in my slippers. Yeah, I was afraid he would tumble over because they were huge on him but he did OK. "Come on over here Scotty in those clumpity clumps," I told him. Then I sat there and thought about it a minute. Where in the world did I get THAT description for over-sized shoes? Pretty soon I realized that I had always called them that... this was my baby word for big shoes, probably because that is the sound they made as I walked along. 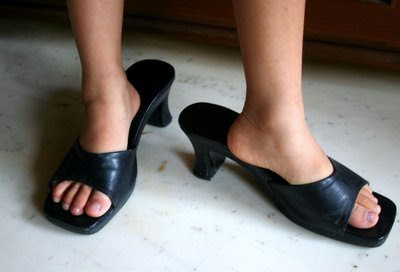 My mom's high heels were the very best sound makers and there wasn't so much carpet back in the late 1950's. It's so much fun to get a flash of insight from my childhood. The detective work has begun! I want to know more about ME and how I got to be the person I am today. Those extra large boots on my husbands side of the closet are calling my name. I might just have to put them on and "clumpity clump" around and see if more childhood memories surface.